Convert Outlook Calendar and Contacts to Outlook vCard,.vcf, vcs, ics and ical formats using SyncWiz add-in for Microsoft Outlook. SyncWiz add-in for Microsoft Outlook is an easy to use Outlook vCard and vCalendar converter. Import and export Contacts and Calendar events into vCard, iCal, .vcf, .vcs and .ics file formats. Backup and synchronize Contacts and Calendar events. Import and export Contacts and Calendar events into vCard, iCal, .vcf, .vcs and .ics file formats. Microsoft Outlook allows you to export only one contact or calendar event at a time. Using SyncWiz you will be able to export and synchronize selected contacts or entire Contacts folder to vcf (vCard) or iCard file. You can easily export and synchronize your Outlook Calendar events to iCalendar (iCal, vcs, ics) files as well. If you want to Export, Import, backup, synchronize or share your Outlook Contacts and Calendar events with others, the easiest way is to use SyncWiz.vcf, vcs, ics converter software. Convert selected or all Calendar events or Contacts to vCard, iCard, iCalendar (iCal), or vCalendar file format. Those files are easily portable and compressible, so you can send the whole Calendar or Contacts folder to anyone as an email attachment or send it via instant messenger, bluetooth, infrared or cable. vCard (also known as .vcf) is a file format standard for electronic business cards. vCard, iCard, iCal files are compatible with Google Calendar, Gmail, iPhone, iPod and Mac, Android, Palm, Blackberry, Entourage and most of cellphones. You can select any Contacts folder, including Microsoft Exchange or Public folders or choose only selected Outlook contacts to export. Moreover, you can automatically synchronize Calendar and Contacts between two or more PCs. Create synchronization profile and have all your changes made to Contacts or Calendar folders synchronized automatically. 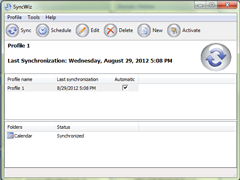 Back up, synchronize, share or exchange your Outlook Contacts and Calendars with SyncWiz. Add-in for Microsoft Outlook allows you to convert your contacts into the vCard format (vcf file). But you can convert only one contact at a time. Now with SyncWiz, you can easily convert or synchronize all your contacts to the vCard format with a few clicks. Automatically synchronize Microsoft Outlook Calendar and/or Contacts folders via vCalendar/iCalendar, vCard/iCard files (.vcs, .ics, *.vcf files). Import iCalendar or vCalendar files (.vcs, .ics files) to any selected Outlook folder. The standard Microsoft Import feature is limited to import vCalendar and iCalendar files only to the default Microsoft Outlook Calendar. Export / Convert any Outlook Calendar folder or only selected events into the vCalendar or iCalendar format files (*.vcs/*.ics). Import / Convert the vCard format files (.vcf files) to a chosen Outlook Contact Folder (vCard Converter). Export / Convert synchronize any Outlook Contact Folder or chosen contacts to the Vcard format files or one file in the chosen windows folder. Synchronization Profiles with different sets of folders. Filter the imported or exported contacts by Category and Private. All day events, Private, Category, Labels, Selected data period. Import items from a selected file or files from a selected folder. Support export to iPod, Mac, Lotus Notes and other files in a different format. Support for vCard versions 2.1 and 3.0. Save all selected contacts in one *.vcf file. Save all selected calendar events in one *.vcs/*.ics file (vCal and iCal). Integrated in Microsoft Outlook toolbar and File menu. Windows 7 and Microsoft® Office 2010 compatible. I *am* enjoying SyncWiz a LOT. I also think 4team have great customer service. I bought another product by accident and customer service team quickly reversed the transaction and called me to let..."